Wear protective gloves, goggles and mask when handling a table saw and power drill. Place worms in a stocking for bait. Place bait in the back of the trap, on top of the trap floor. Release the armadillo away from your property or contact your local animal control center to pick up the animal. Although there are many species of armadillo around the world, the United States is home to only one. Armadillos are nocturnal animals that eat insects and will damage your yard by burrowing for food. Protect your yard from damage by building an armadillo trap out of wood. A wood trap is are portable yet strong enough to catch armadillos. Trapping an armadillo is a humane way to remove it from your property. Construct a wooden, rectangular box that is 12 inches high,12 inches wide and 36 inches long. Cut four 12 inch-by-36 inch plywood pieces to form the top, bottom and side pieces. Cut two 12 inch-by-12 inch plywood pieces for the back wall and front door. Cut two 12-inch sections of 2-by-4 planks for a trap door. Cut one 12 inch-by 30-inch plywood piece for the trap floor. Use a table saw. Place two side pieces vertically. They should be parallel positioned 12 inches apart. Place the bottom piece horizontally on top of the two side pieces. Hammer nails through the bottom piece into the top edges of the side pieces. Invert the structure and repeat the step to attach the top piece. Place the back piece on one open end of the structure. Hammer nails through the back piece into the edges of the structure. Attach a five-inch circular drill bit into a power drill. Drill a five-inch hole into the top of the structure. The hole is used to observe the inside of the box. Cut a one-half-inch indention into the center of each trap door, using a table saw and a half-inch blade. Place the trap doors into the trap with the indention facing inwards. Place the indention in the wood right outside of the structure. Nail the door slides in place by hammering one-inch nails through the trap into the trap doors. Drill a one-eighth-inch hole into the back of the left trap door, two inches from the top. Drill completely through the trap door. Drill a one-eighth-inch hole on the back of the trap floor. Place a one-inch wooden dowel underneath the trap floor towards the back of the trap. The back of the trap floor should be in the air. The front of the trap floor should touch the bottom of the trap. Insert and tie a fish wire in the hole. Tie the other end of the fish wire to a one-eighth-inch loop screw. The fish wire should be approximately 36 inches long. Adjust the fish wire length, so it is tight when the loop screw is placed in the trap door hole. Insert the loop screw into the trap door. Place the front door into the indention of the trap doors. The loop screw holds the front door in place. When the armadillo enters and puts pressure on the back of the trap floor, the loop key is pulled out and releases the trap door. 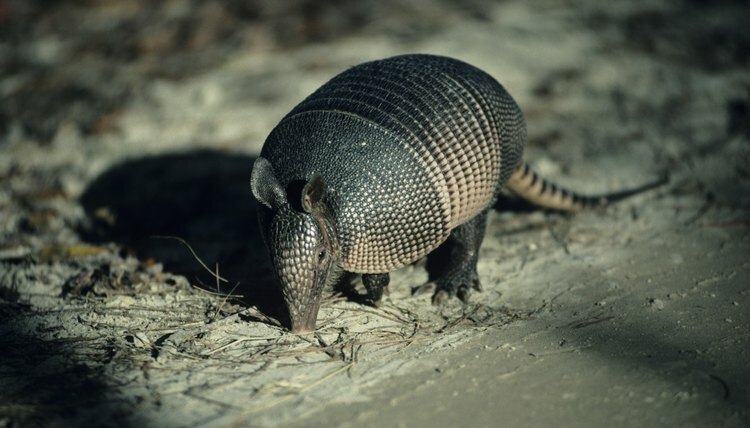 Michigan State University: Armadillos: Funny Animals, or Destructive Pests?